Last year, Israel revealed it had obtained a multitude of documents on Iran’s nuclear weapons program from inside Iran, and perhaps more important than what was in the documents is that the continued storage of the information by Iran showed a desire to retain nuclear weapons knowledge—not unlike the intent behind the SPND group sanctioned by the Americans. “[SPND’s] continued existence highlights the problem of Iran continuing to try to maintain the option for itself of going back to its old way that we are obviously trying to prevent from occurring,” said the second of the US senior officials. “This is a danger that was highlighted by the so-called Iranian nuclear archive, which the Israelis rather daringly spirited out of Iran not too long ago, but is an extraordinarily important point to remember because the very squirreling away of all of those carefully preserved records from that program also goes to this point of reconstitution. That US official noted that the SPND threat goes hand-in-hand with a key problem in the Iran nuclear deal. The accord had a so-called “sunset clause” that would eventually permit Iran to increase its nuclear fuel enrichment program. As a result, the “breakout time” needed to develop nuclear weapons would have likely shortened to less than a year. “Having that short breakout time for the material to produce a weapon, with people from SPND who have been waiting around and practicing their tasks, in effect waiting for the opportunity to put them back into service in a weapons program, just goes to the point of how critical it is to prevent that breakout time from shrinking,” said the official. The American moves, therefore, are intended to make financial activities and travel more difficult for the SPND group, scare off companies who might want to do business with it, and discourage new experts from joining. 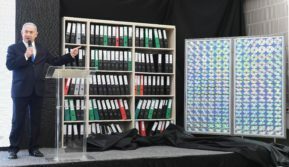 SPND—and the continued involvement of Fakhrizadeh—was highlighted by Netanyahu in 2018 when he unveiled the Iran nuclear archive. On Friday, the second American official cited some US nuclear history from World War II to clarify the real danger posed by SPND. “It’s as if some evil version of Robert Oppenheimer had been kept in charge of keeping the Manhattan Project crew together for years afterwards pretending that they were—or even legitimately working on other things but being very carefully kept together in order to be able to be called upon to get back to their original line of work [to build nuclear weapons],” said the official.